“We met through surfing last year,” a young Korean couple holding on to surfboards said on a sunny day at Hajodae Beach in Yangyang, Gangwon Province. The two had their faces covered in thick sunblock, their bright smiles matching. “We liked surfing so much that we eventually quit our jobs and went down to Jeju Island together to live there for a month surfing,” 27-year-old Um Kyu-ri said, holding hands with her boyfriend Woo Im-kyun, also 27 and a kindred spirit. Surfing is the latest trending summertime water sport in Korea. Each weekend, social media platforms are abuzz with 20- and 30-somethings sharing photos of their adventures on the waves. The popularity of surfing is fueled by easy access and affordable prices. A new expressway connecting the capital city with the eastern beach in Yangyang opened a year ago, allowing for a quick weekend getaway. KTX bullet trains from Seoul provide easy trips to the surfing towns in the eastern and southern coasts of Korea. A domestic flight to Jeju Island could do the trick, too. In Goseong, an hour’s drive up north from Yangyang along the coastline, tourists often try out surfing, just for the sake of the experience. 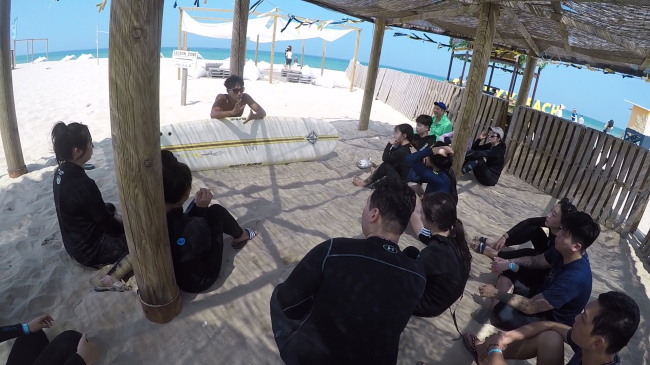 “Surfing had never crossed my mind for this trip,” said Yoon Sang-moon, a 27-year-old office worker in Seoul who recently took a weekend respite at the quiet Cheonjin Beach in Goseong. Yoon had pictured himself relaxing by the sea, but once he arrived at the hotel he had booked, what awaited him was a surfing rental and lesson shop just next to his lodging. Yoon’s first surfing experience was with the Korea Pro Surfing Association’s registered surfing master Kim Min-ho, at the Let Me Surf school, where the lesson package complete with board and wet suit rental amounted to 55,000 won ($49). Hwang Won-joon, the 43-year-old founder of the surfing association, said the number of registered surfers had grown to over 8,400 as of June, 28 times the figure from six years earlier, which was 300. First-generation surfer Hwang recalled the days when he first started surfing. People confused Hwang in his black wetsuit for “haenyeo,” a female diver of Jeju Island. That never happens anymore. With more beaches in the country offering beginner classes complete with necessary amenities, surfing is becoming less of a Hollywood film scene in Koreans’ minds. “The beach culture here is finally catching up with what Koreans have been exposed to for a long time on movie screens,” said Lee Hyung-joo, 34, one of the directors of Surfyy Beach, a family friendly surfing establishment in Yangyang, Gangwon Province. Lee said the surfing scene in Korea had long remained unchanged despite the amazing waves the country gets. The change came as younger surfers gained overseas surfing experience and decided to return to their Korean hometowns. Things have changed in a big way. A host of beautiful beaches across the nation are drawing surfers, with the number of surf shops and one-day lessons soaring. Even newcomers are drawn to the laid-back aura of beach life, away from the city. The waves may be just right for experienced foreign surfers, too. Jake McFadyen, 28, who has surfed for 17 years, currently works at Surfyy Beach as an events coordinator and English language surf instructor. Originally from British Columbia, Vancouver Island in Canada, McFadyen started surfing in Tofino surf town. Kim Ji-young, a 26-year-old office worker who has surfed around six times in Yangyang and Busan said that having one’s own car would facilitate surfing in Korea. “But apart from that, the whole surfing experience itself is affordable,” she said. While working in Seoul, Kim does not get to move her body much at all, but a day out at the beach surfing makes up for all the lack of exercise. “Office workers who enjoy physical activities are jumping into the sport. The only thing you have to prepare is the expectation of getting slapped around by the sea water,” Kim said.